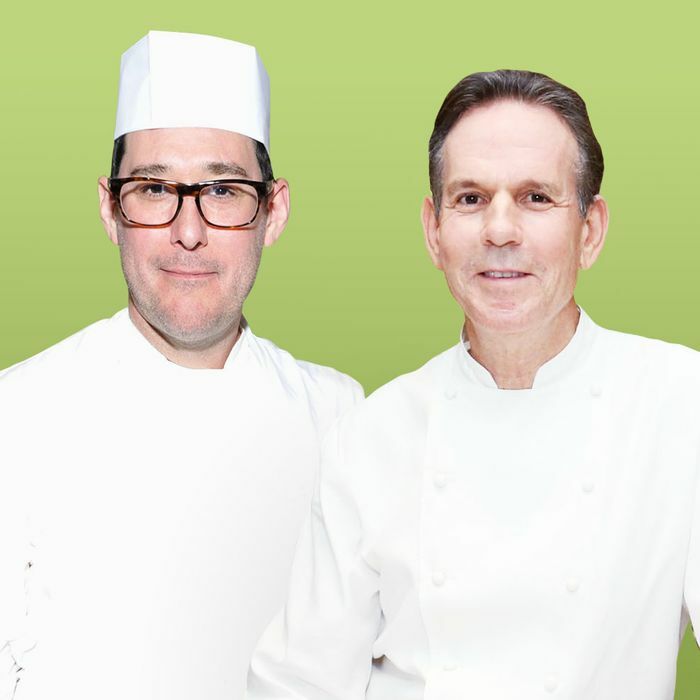 Mark Ladner and Thomas Keller. By 2016, the market for gluten-free foods will earn $15 billion in annual sales. Pizza Hut sells gluten-free pies. There are gluten-free Girl Scout Cookies. Taco Bell is even considering offering gluten-free gorditas. Despite the fact that only a small percentage of the population suffers from Celiac disease, the gluten-free movement has evolved into a full-blown lifestyle choice, and it’s a powerful diet that restaurants can no longer ignore. If there are two chefs at the forefront of accommodating food allergies, it’s Del Posto’s Mark Ladner, who has his own gluten-free-pasta side project, and Thomas Keller, perhaps the most acclaimed chef in America, who also co-founded Cup4Cup — the leading gluten-free flour that Ladner uses in his pasta. It’s clear that this movement — and the rise of food allergies, in general — will have a major impact on the future of fine-dining. But will diners use the “allergy card” irresponsibly? Should all great restaurants be able to modify menus? Can a wheat-free dish really imitate the taste of the original? Grub called up Ladner and Keller to discuss all these questions — plus many more. When did you first decide to focus specifically on gluten-free food? Thomas Keller: At the French Laundry, we’ve been serving the [salmon] cornet for 20 years — or, at that time, 18 years. And at Per Se for nine years. It’s become an icon at those restaurants and something that — up until we developed Cup4Cup — those who were gluten-intolerant or had Celiac disease couldn’t enjoy. They would see it come to the table, their dining companions would have it, they would smile, they would tell them how good it was, and they were left with something else. And regardless of how good that something else was, it wasn’t the cornet. And that was something that really bothered us. And then your research and development chef, Lena Kwak, developed the recipe? Keller: Yes, when Lena came along as our first R&D; chef, that’s exactly what I tasked her with. I said, “Go and make a cornet that tastes, smells, feels, and looks like the original. Don’t come back with some abbreviation of it, or something that’s different.” And so she went off and developed a recipe for the cornet, using a non-gluten formula. It was extraordinary, and I was extremely excited. Mark Ladner: Chef, do you now use the Cup4Cup for all the cornets now? Keller: No, we don’t. We use it to make the gluten-free one. We continue to make both of them, in other words. And it’s only because the environment that we’re in — we make the gluten-free cornets at the Bocuse Training Center, where we do not have any infiltration of flour. The other cornets are made in the French Laundry kitchen, where there is that contamination, if you will, of flour. But at the Bocuse kitchen, we’re able to clean it and remove any flour on surfaces and in the air, because we don’t use that kitchen for a lot of production, and certainly not a lot of production that has flour. Keller: That’s the reason that we don’t offer non-gluten products at our bakeries. It’s just impossible for us to really qualify that the non-gluten products at Bouchon Bakery would be 100 percent non-gluten. Ladner: Yeah, there’s so much airborne flour! Keller: So that’s the reason we don’t do it in those environments. It’s just because we can’t really control it. Now, for someone who’s intolerant to gluten, a small amount of flour doesn’t really affect them. But to somebody who’s very, very sensitive, it could. Do you remember some of your early gluten-free cooking experiments — ones that didn’t quite taste right? Keller: Lena didn’t bring me any of the failures. Failure wasn’t an option. I wasn’t really interested in tasting something that wasn’t good. Mark, do you remember your early days of experimenting with gluten-free pasta? Ladner: We were experimenting — as I’m sure, similar to chef Keller — with brands like Bob’s Red Mill … And when we first started using Cup4Cup, we thought that we would not necessarily improve on it, but at least make it a little bit our own. We started adding other flours to it, just to differentiate — and then quickly realized that that was a colossal mistake, and went back to just using the original recipe, because it was already perfect. Keller: Oh, thank you. That’s nice of you to say. Ladner: — because there are a lot of ingredients in it, but they’re in such a balance that it really works. And there are so many challenges with trying to make gluten-free products seem as if they’re not gluten-free. One of the main crutches is adding a lot of dairy, which really is sort of cheating. Why is it that so many gluten-free foods miss the mark? In general, should chefs try to imitate what wheat tastes like, or create something that’s different but still great? Keller: We always go back to our childhood to think about food, and certainly, as we grow older, some people become gluten-intolerant and they remember a chocolate-chip cookie that their mother made. Reference points are important. We want to be able to give them the opportunity to have that experience again, with their mother’s recipe — and that’s the important part of this — that it’s our flour and your recipe … You want to have pasta that tastes, feels like real pasta. You’re trying to capture the emotion about food that’s so important. Ladner: Most of the experiments that we had done with pasta tend to use two primary flours: Either more corn or more rice. Rice tends to be really elastic, and corn tends to be plastic. It wasn’t really until we started using the Cup4Cup that we were able to find that balance that could potentially be perceived as al dente, because the other two just seemed to be too much on the far end of the spectrum. Do you worry that because you’re so accepting of gluten-free diners, you’ve set yourself up to have to accommodate any type of diet? Ladner: Yes, one of the things that we’re struggling with now is that we’re becoming known for being able to accommodate people, so more and more diners start to come in with requests. And then it’s becoming a larger and larger percentage of our tables and our tickets … We’re in the type of business where we don’t really say “no” to the guest, and in those few instances when you do have to, you’re beating yourself up and hoping to find a solution to not have to be in that position again. This is certainly a movement that’s gaining momentum, and I think that chef Keller and I have the advantage of having addressed it sooner than others, but it’s only going to get more complicated as you deal with more and more allergens, and people being more and more vocal about them — especially if you’re trying to say “yes” every day. Would you agree, chef? Keller: Absolutely, and you hit the nail right on the head because that’s what chefs want to do. We want to say “yes.” We’re trained from infancy in our careers to say yes. I mean, God forbid you’d say, “No, chef,” right? Ladner: [Laughs.] I’ve never heard that before. Keller: It’s part of our training, and so we’re always constantly trying to find the best ways and the resources to be able to give our guests the experience. It’s very, very important to us. It’s a natural thing. There are certainly people who have Celiac disease, and actually do become ill from gluten. But do you find it frustrating that many people give up gluten under the façade of a health problem, when it’s actually a lifestyle choice? Is there a concern that this will snowball out of control? Ladner: That’s something that we’ve been struggling with a lot here, because we do focus so much time and energy on dietary preferences — where people come in and say, “I don’t want this or that.” And we found it to be very dangerous to make a distinction between severity, like whether it’s a preference or an allergy or a life-threatening illness. If you start to entertain the thought that one should be taken more seriously than another, that gets really, really sketchy. So we treat everything as if it’s life threatening, because it’s more dangerous to suggest that some aren’t. And you don’t want the staff to become desensitized. Keller: … What bothers me is when somebody comes in and they use an allergy as an excuse when they don’t like something. And it’s like, Okay, so we use onions in our stock; how sensitive are you actually to onions? Is it raw onions, is it cooked onions? At what point is the allergy going to kick in? And then they finally say, “Well, I’m not really allergic to onions; I just don’t like them.” And that’s fine. The allergy thing is concerning for us because it could create health concerns. If you don’t like something, then fine, we can leave the onions out of it. In the bordelaise sauce, which has onions in it three generations prior, you’re never really going to taste those onions anyway. But whether it’s an allergy or a like or a dislike, it’s relatively easy for us to accommodate them. Keller: Yes. But the allergy card has been used kind of irresponsibly. If people just say, “You know what? I really don’t want to eat cheese. I don’t want to eat dairy. Can you do this without dairy?” Yeah, we can do it without dairy … If it’s a great restaurant, then you should be able to eat healthy, first and foremost. They’re using the best products available and they’re processing them and using the techniques that would result in a high nutritional value. At the same time, if you’re going to a great restaurant, they should have the capacity and the knowledge and skill to modify a menu to accommodate any kind of dietary restriction. The bigger question is how to eat healthy at not-great restaurants! There also seems to be this health halo over everything gluten-free right now. I eat a lot of sweets, and if I see a pastry that’s gluten-free or vegan, I tell myself it’s healthy, which of course isn’t true. Ladner: From a marketing perspective, it’s been great for lots of the prepared-food industry. About a year ago, we started trying to develop a menu that was gluten-free and vegan as well, and I visited a lot of health-food stores, trying to educate myself about this entirely new lexicon of ingredients. You start to realize that there’s just as much bad food and junk food, but it’s just labeled in more creative ways. For example, brands love to put “gluten-free” on the package of foods that never contained gluten in the first place. I don’t know what that really is about, but they must think it’s working for them, because they continue to do it. So there’s just as much marketing ingenuity out there in all different markets … But I think that ultimately it’s going to end up being a really great thing for food, and once people start to support smaller farms producing wheat and other grains, and get more involved with milling and having a deep understanding of what’s involved in the process, that will definitely help as well. What are some the obstacles you continue to face in cooking gluten-free food? Keller: One of the issues that we had with Cup4Cup, right out of the gate, was that it contained milk powder. A lot of people who are gluten-intolerant, or have Celiac, are also allergic to dairy, so the milk powder was an issue for them. But it gave us the texture that we really wanted, so it was something that we decided to continue using. But then, of course, GMOs became one of our issues, and that was something that Whole Foods has asked us to look into — to develop a formulation of Cup4Cup that’s non-GMO. Lena has addressed both of these issues: Cup4Cup’s Wholesome Flour blend was specifically created to address the issue of dairy intolerance, and all of Cup4Cup products are now made with the non-GMO ingredients. Ladner: … A lot of people are talking about teff now, which is this Ethiopian grain that they use to make that injera bread that’s eaten with everything. But most things present their own sort of dietary restrictive issues. There’s nothing that’s impervious to someone having some sort of problem with it. It’s really hard. Are there any new gluten-free dishes that you’re hoping to conquer within the next year? Ladner: Gluten-free, to a small extent, is a low-hanging fruit in the allergen world. It’s becoming really difficult to be creative. In fact, I’ve found that in the last couple years, all of my creative energy has gone into trying to navigate dietary restrictions … One of the things that’s most misunderstood about the making of pasta is that it has a lot more to do with the cook and the saucing than just the dough itself. When we started substituting Cup4Cup for our other flours, certainly the texture and the recipes changed a little bit, but it really wasn’t that drastic. It was more about trying to teach ourselves how to now cook it in a way that most replicated gluten pasta. The recipe itself really did the work. We just put it together.